It seemed fitting that the artist Tom Gottsleben lived and worked in what had once been an abandoned Saugerties stone quarry. Gottsleben, who had been a painter before coming to the property in 1982, discovered early on that the stone there had the potential to express deep and timeless ideas. They were ideas he had been exploring since childhood when he was captivated by the teachings of the late Indian sage Ramana Maharshi. 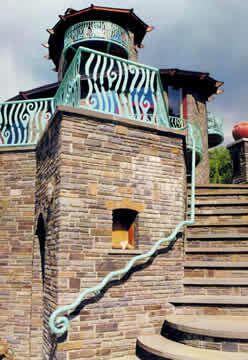 Over some three decades, Gottsleben transformed the property into a garden for his bluestone and crystal sculpture and a five-level spiral house that was built almost entirely from stone quarried on site. He designed the home with his wife, Patty Livingston, using principles of sacred geometry, with input from engineers only at the very end. 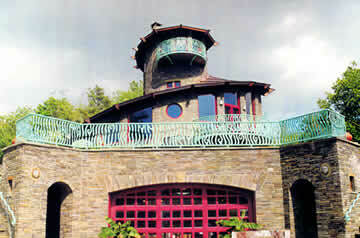 But more than the discrete elements that Gottsleben created — a unique home, the visionary and joyful sculpture dotting the property, and the serpentine stone walls, gardens, and trails that tie it together — he took what had been a ravaged 35-acre landscape and returned it to unity with the Catskill terrain that was its origin. Gottsleben died there unexpectedly on Tuesday evening, January 15. Gottsleben liked to point out that the stone and crystal he worked with are actually the same material: silica. Stone is hard, dense, and opaque, while crystal is clear, light and transparent. 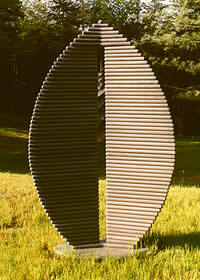 The artist believed that the combination of the two served as a metaphor for the oneness that we humans often interpret as a duality of opposites. This exploration of unity informed both Gottsleben’s work and his life: a desire to make art that evokes essential truths. The result was art that is both intellectually complex and yet beautiful, mathematically precise and also poetic. 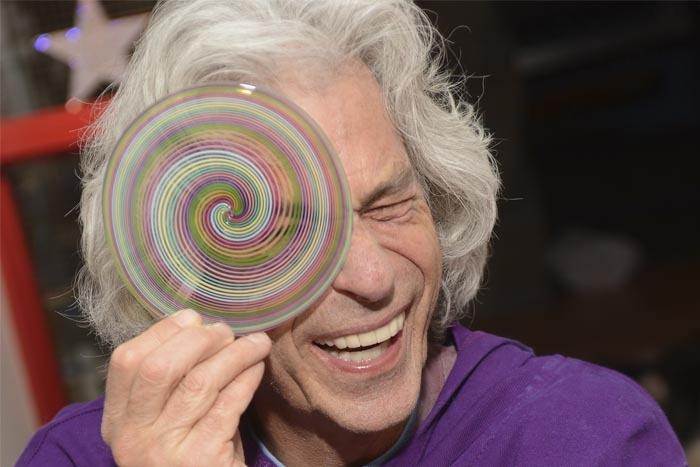 His work — including the 25-foot wide, 12-foot high bluestone and colored glass rainbow of seven arches — appealed equally to children of all ages. His work was a reflection of a quirky, unorthodox, and inclusive personality. 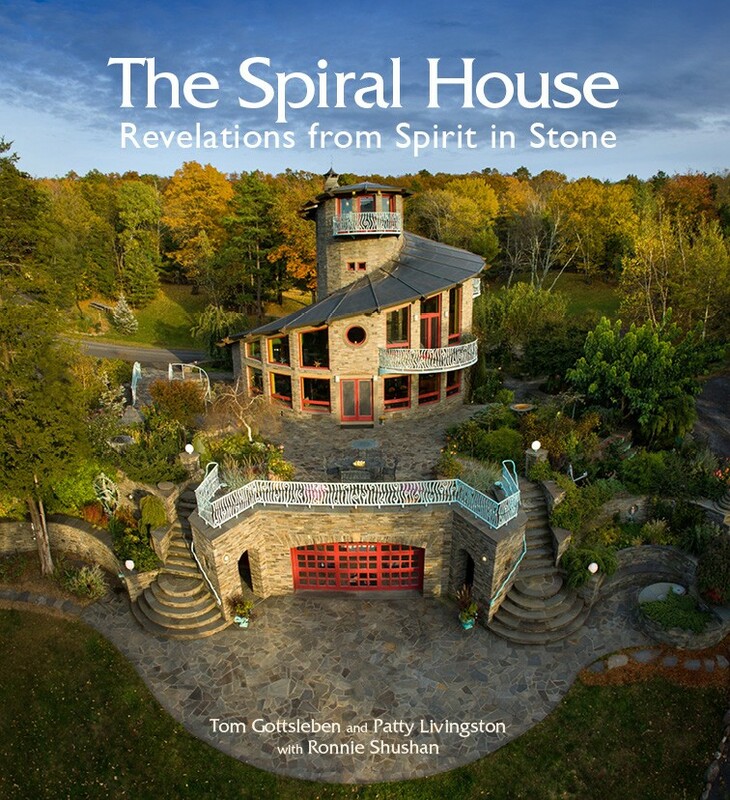 He believed in working with what the universe provided — the stone on their property, the many local artisans who contributed to the Spiral House — rather than striving for what one didn’t have. He lived in a state of wonder and awe at the world around him, curious about and generous to everyone he met, mentoring many in their commitment to a spiritual path. A vegan for nearly 30 years, Gottsleben had a respect and compassion for all lifeforms, from the tiniest bugs and critters to a work crew who were more like family. Born in Milwaukee, Wisconsin on November 11, 1950 to the late Gloria Louise Blaisdell Gottsleben and the late Colonel Alvin Gottsleben, the artist was an Air Force brat who came of age in the 1960s. He would say he was educated at the San Francisco Art Institute and an Indian ashram. An early devotee in the 1970s of Guru Maharaj Ji, now known as Prem Rawat, he showed a talent for business management at the teacher’s Divine Light Mission network and later in the corporate world. 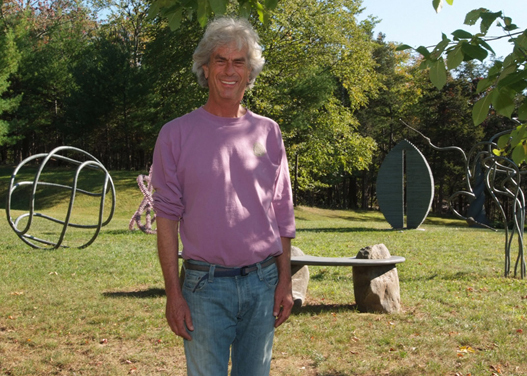 After meeting his wife in 1982, Gottsleben began commuting between his business consultancy work in New York City and the ranch house on the Saugerties property. City life soon gave way to country life just as his painting gave way to sculpture. 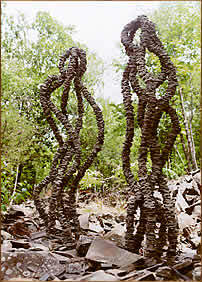 Gottsleben found a story in every stone he collected on the daily walks he and Patty took with their Airedale, Rafferty. After the sudden death of this beloved dog in 1988, the artist built a stone bench as a memorial. The bench led to undulating stone walls and a stone fountain that, in turn, launched him into stone sculpture. 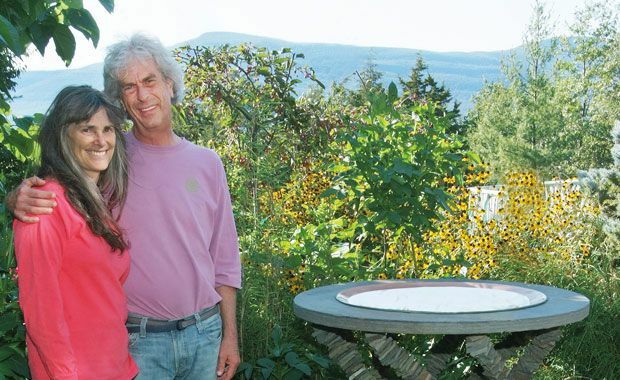 In addition to his wife, Patricia Livingston, Gottsleben is survived by a sister, Gloria Gottsleben of Littleton, CO; cousins, nieces and nephews; and a wide circle of friends and colleagues that make up the Spiral House community. A memorial for family and close friends will be scheduled at the property in the spring. Gottsleben’s art can be viewed locally at the Elena Zang Gallery in Woodstock and on his website, tomgottsleben.com. In lieu of flowers, donations can be made to the Catskill Animal Sanctuary in Saugerties People for the Ethical Treatment of Animals, and the Ulster County SPCA. H 80" | W 47 1/2" | D 14"
The Gottsleben Home, an architectural wonder unto itself, called for numerous railings and balconies to complete its exterior. 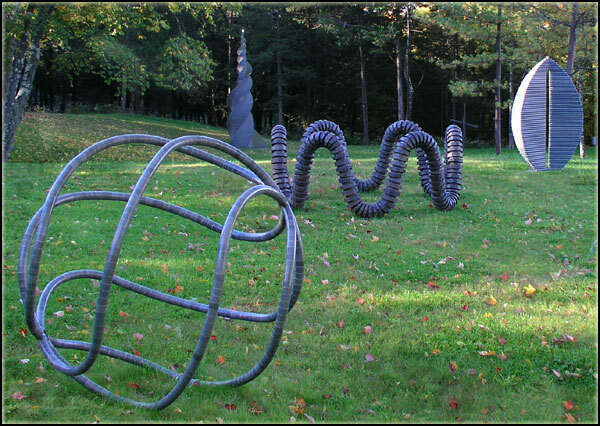 The theme of the house is spirals, and Infusion was commissioned to create railings that not only reflected this theme, but also each twist created a complete line that mimicked the outline of the nearby Catskill Mountain range. 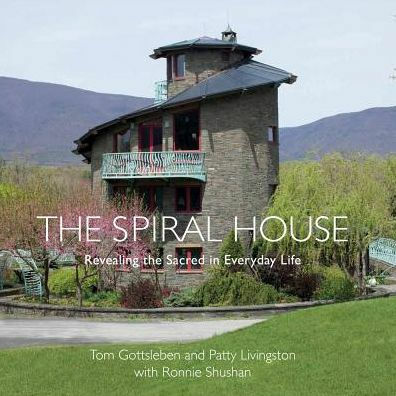 "The design of the Spiral House is based on the universal precepts of sacred geometry and sacred architecture. In this light, a house or temple (or sculpture, for that matter) should architecturally and physically express both a cosmology and a physiology: it should be a reflection of the wisdom "'as above - so below", as well as embody the 'macrocosm / microcosm' insight. It should be a place where a sense of the sacred can be tangibly experienced; a meeting place of heaven and earth where the practical and the spiritual are balanced and integrated with the environment. The spiral is a universal form and pattern found in all cultures, since the very beginning of mankind's markings. It is the shape of both our galaxy as well as our DNA, and therefore - is an excellent symbol of the macrocosm/microcosm insight. 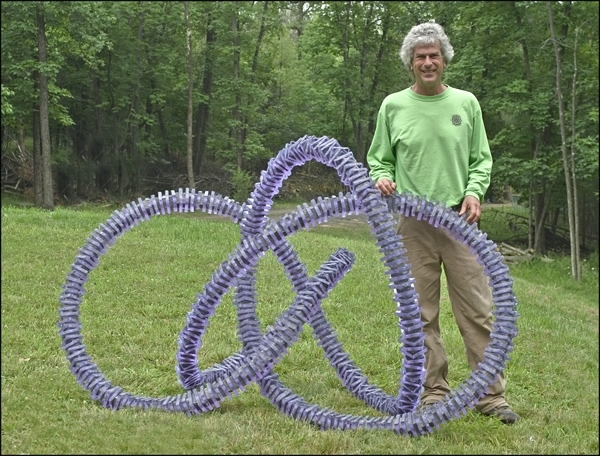 The spiral is a sign of movement and growth, as it describes a path and connection from the center to its periphery, in a fractal - or self similar way. Some spirals, like the spiral of the nautilus shell, literally embody the ideal or Golden Proportioning system (a.k.a. The Fibonacci Sequence), which has been used in art and architecture since antiquity to emulate nature's patterns of proportion, harmony, and beauty. When designing our new home, the spiral form of the nautilus shell best expressed a sense of organic growth and harmony with nature - in a way that would be functional, yet also stimulate and inspire those who would experience it. 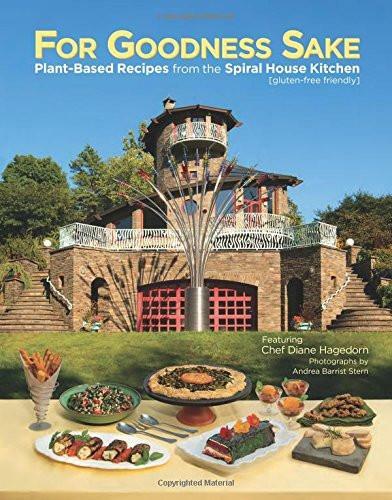 The spiral house was designed and built by my wife Patty and myself, along with a lot of help from our friends. It is a 5 story spiral structure that 'turns' 2 1/4 times around it's axis; the central column of a 32 ft. stainless steel and glass spiral staircase. 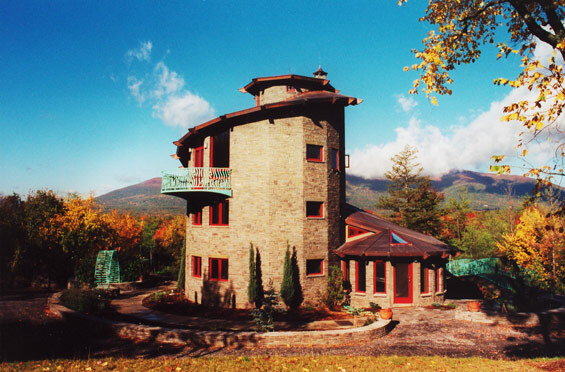 Constructed of concrete, steel, bluestone, wood, glass, and copper, it was completed in 2001."